Leading up to Neverwinter’s annual Food Fest extravaganza many members of the Dearborn company were hired on to bulk up the number of guards available for the event. Several of these part-time guards could participate, and take first prize, in the event’s competitions. Dearborn leader and co-founder Tsiya reported that several of the Dearborn guards noticed an abnormal number of Kobolds at the event, and followed them to the city sewers. “They discovered some sort of hideout,” said Tsiya, “and did what Dearborn do best: took care of the problem.” The leaders of Dearborn urge members to stay wary and report any further incidents that may be related to what happened at Food Fest. A Dwarven clerk named Fimbul, hailing from Neverwinter, discovered information in his late father’s papers about a forge operated by their family long ago. He brought the information to the Dearborn Company: in exchange for finding the forge and returning a long-lost heirloom axe, he offered the Company whatever else they found there. The adventuring party, having accepted Fimbul’s commission, matched his sketch to a map of a river valley in the Sword Mountains then traveled through a portal in a sub-basement of the Guild Hall and landed at the valley’s mouth. They traveled to the forge, dealing handily with a group of wild boars on the way–and realized it was no simply smithy but a temple to Moradin with a forge at its heart. And it was occupied by a tribe of Orcs. 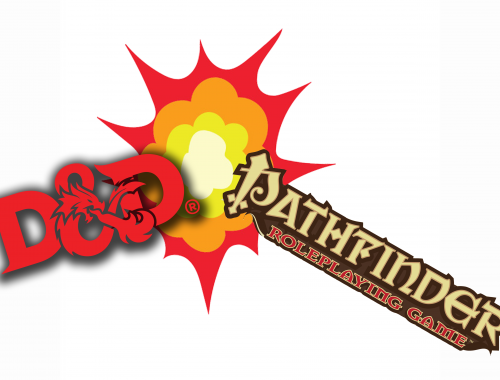 After defeating two separate groups of orcs and their pet dire wolf, as well as finding their way safely past a pair of trapped hallways, the party came face-to-face with the furious Warlock who led the group. After a short but furious magical battle, the Dearborn Company emerged from the temple’s forge room with the axe. Fimbul was overjoyed to have the axe back in the hands of his family. In conjunction with the annual Neverwinter Food Fest there is an annual Knight Tourney. On the night preceding the Tourney the Dearborn Company was visited by a rather eloquent bullfrog. He stated he was Ishmael of Menzoberranzan, a knight of the lady Estelle VarEmerys. He had been cursed by a special device stolen from him by a sorcerer, whom he learned had been killing off winning knights of previous years. Ishmael asked that the group find the sorcerer and bring him to justice, as well as restore the crestfallen knight’s form. The Dearborn group entered one of their own as the noble knight’s stand in and fought their way to victory through jousting, melee, and ballad composition. In the end they won and sure enough were attacked by the Yuan Ti sorcerer and his elite squad of Grungs. In the end our mercenaries were victorious in besting the murderer and restoring the drow knight. A more chivalrous party has never been. The local community outside of 100 Acre Forest had become overwhelmed by evil wizard Christopher Robin’s hallucinogenic ‘honey’ and recruited the Dearborn Company to stop him from expanding his drug empire to the entire Sword Coast. The party made their way to the giant oak headquarters and were greeted by Robin’s close friends and personal security detail: of a teleporting armored tiger, a timid but powerful pink boar, and an enormous gold bear with a deadly ‘bear hug’. They party made quick work of the muscle, going so far as to making bacon of the pig. Christopher Robin, left undefended, was no match for the party. With the leader overthrown, the party destroyed the magic core that was infusing the honey with the hallucinogens. Control of the facility was turned over to the gnomes who had been working for Christopher Robin. Thanks to the efforts of the Dearborn Company they wouldn’t be left jobless in this economy. The Honey distribution plant of the 100 Acre forest is now a completely legitimate operation and delivers jars weekly to the Dearborn Company as a token of their continued thanks. 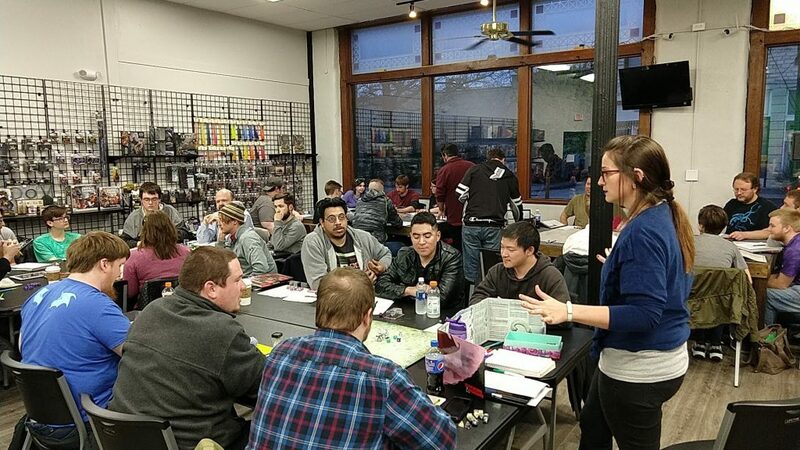 Come be a part of Dearborn Company and our Open Campaign for Dungeons & Dragons every other Saturday evening at The Village Geek in downtown Manhattan, KS!